I was able to play with the new Veeam Backup & Replication v10 feature CDP before we showed it to the public. I talked about it a lot with the product manager Vlad and it was very cool. I know it will help a lot of customers. I want to talk about it in this article to make sure people have it in context. Important Note: this article is using screens from, and is about, pre-release code, however, I will keep it updated as the product and my knowledge and experience progresses. Veeam CDP is continuous data protection – most often talked about as CDP. You can learn more about it as a generic topic in this Wikipedia article. Basically, it means replication on a continuous schedule – such as at every 15 seconds. This is compared to the 15 minute replication interval that Veeam currently has. The current replication with Veeam uses VMware snapshots to do the replication but the new CDP with Veeam v10 CDP does not. So less impact on the VM and storage. It uses the new VMware vSphere API for I/O Filtering. You can learn more about VAIO in this article. The important thing to understand is that no snapshots are used by CDP and it is using a VMware API to capture writes so very little impact on VM, storage, or hosts. It is a policy and it looks just like a replication job. There is one UI difference only and that is the Schedule page. You can see some interesting stuff on this page! For example, I love the defaults of a restore point taken every 15 seconds, and four hours of those restore points are kept. Then every 8 hours a restore point is taken and kept for 7 days. As you might expect you can tweak those values to fit your environment. The Schedule button seen above is to allow you to choose when you do application consistent restore points vs. crash consistent restore points. You can chose the time that is best to do application consistent restore points. As well, when you restore, there is different screen. The color denotes the possible restore points as well as if they are application or crash consistent. You can pick the latest restore point or pick your own! What should I think about when using CDP? There is a number of things to think about when you wish to use CDP. Here are some things to consider. You can still use the original Veeam replication. Templates and powered off virtual machines will not be able to be replicated by CDP at 1.0. You should not use CDP to replicate everything, but rather think about what applications require that functionality. So, applications that you cannot run your business without. If you can choose a bigger replication interval you should. If you pick 60 seconds or 5 minutes for example CDP has more time to organize the replication and can do things like deduplication as it does not have to work as hard to keep up. If you choose 5 seconds it will do not be able to organize the replication as much since it needs to work fast to maintain the RTO. This has an impact on your network requirements. You should pick what you think is reasonable and appropriate and monitor it and see how it works. Remember that applications that are very transnational oriented and have lots of changes will not handle the very lowest interval as well as an application that is not highly transnational so make sure you test to see what works best for you. It is very exciting to me to have such an amazing feature in a product that is so easy to use and configure. In my experience CDP has never been easy to configure and use before so Veeam has absolutely elevated the game. My understanding from using the Veeam Backup & Replication v9.5 Enterprise Plus Edition is that the VM replication is taken live using the Storage Array Snapshot (not VMware snapshot) when your Veeam Backup Proxy is a physical server. So this new Veeam CDP Replication is leveraging new vSphere 6.5 VAIO which is not categorized as a snapshot ? If there is no storage integration, or if the customer chooses to not use storage integration, then VMware snapshots are still used. 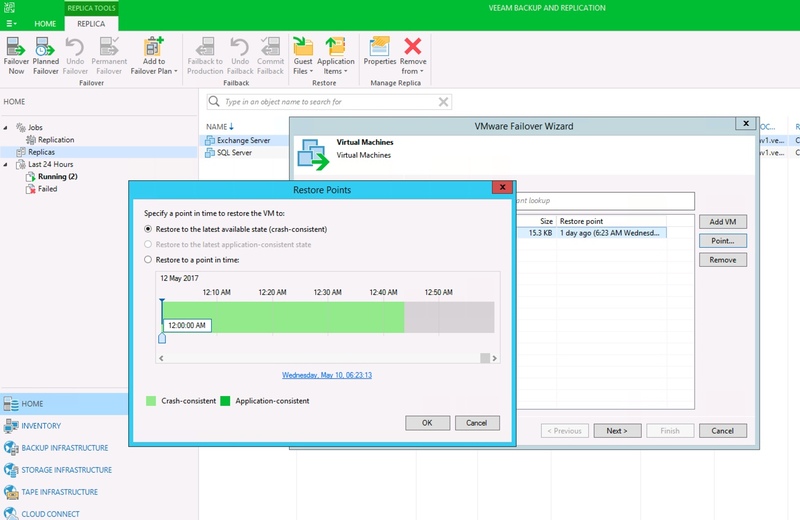 When Backup from Storage Snapshots is used the VMware Snapshots are still used but only open for a few seconds.Veeam replication always uses VMware snapshots. That is, until v10 is GA, and then you have a choice of the previous version that uses VMware Snapshots or the new CDP that doesn’t and uses VAIO. It does doesn’t it. But v10 has a bunch of cool stuff in it. Do we need to take vsphere up to at least version 6.5 in order to get this to work or will CDP in version 10 work in vsphere version 6.0? We’re looking at Zerto but have a Veeam 9.5 running smoothly in our environment currently, but only replicating once a day to our DR.
As this feature is still under development, I cannot comment on the exact requirements that will be necessary at GA. I can say in the demo I did on stage, and in my own lab where I am playing with this feature, I am using vSphere 6.5. Is there any facility to group VMs from the same service into a single replica job? Would this VMs have write order fidelity? We are still early in dev and so I hesitate to answer as it may change before GA. I can say however, that VMs will have write order fidelity, but with themselves only. Not necessarily with other VMs in the job. I am not sure, but I can tell you we are still in early working with it and will do what we can and continue to improve it over time as customers get to use it. What ‘s about consistency snapshot with vss ? 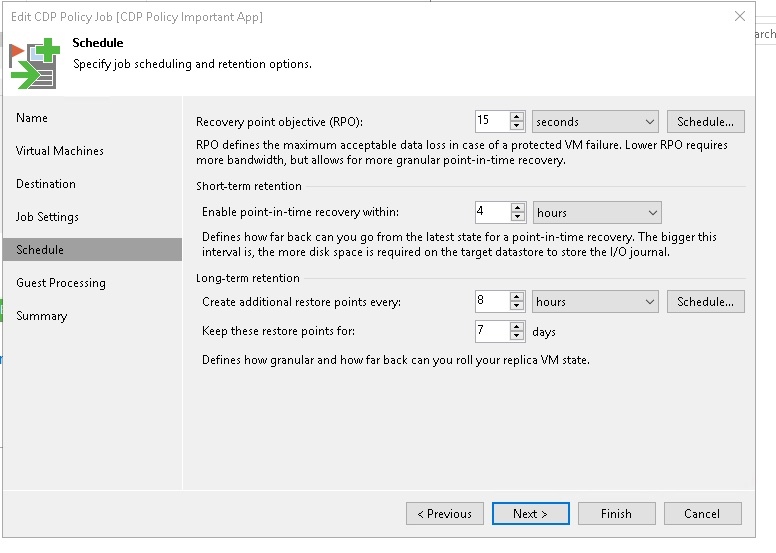 My understanding is that in normal veeam replication vmware/veeam use vss integration on microsoft vms but it seems here with cdp that there is no more consistency. So every IO is in the journal and replayed on the replica but underlying applications (like sql or exchange etc…) are not aware at all of this ? Product is not out yet, so remember that, but, there will be, or should be application consistent capabilities. There is in beta and I expect at GA they will be there too.